What is the difference between how men and women lead? Are you a leader because you’re a woman, or is it about the individual? What do you think about Mary Barra and her role? 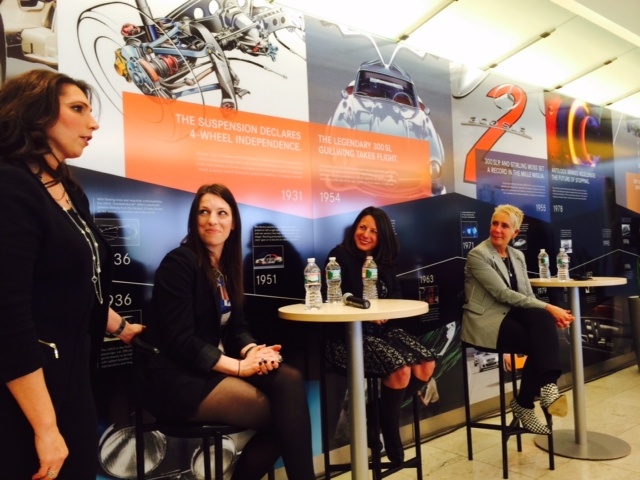 All of these questions and more were posed to our fearless leader Sam DiGennaro on a panel this week at Mercedes-Benz’s U.S. headquarters in Montvale, N.J., in honor of Women’s History Month. 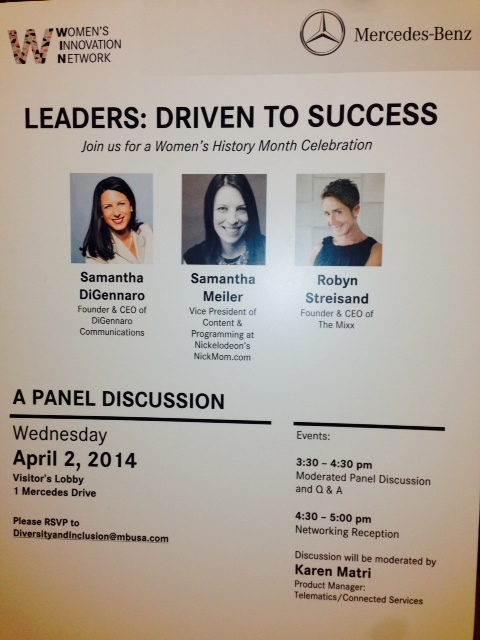 As successful women with unique perspectives on leadership, Sam, along with Samantha Meiler, VP, Content & Programming, at Nickelodeon’s NickMom, and Robyn Streisand, Founder & CEO, The Mixx, a marketing agency, were invited to sit on the panel moderated by Karen Matri, Product Manager, Telematics and Connected Services at Mercedes-Benz USA. The event was sponsored by the company’s Women’s Innovation Network, an employee resource group that champions career advancement and personal growth for women. 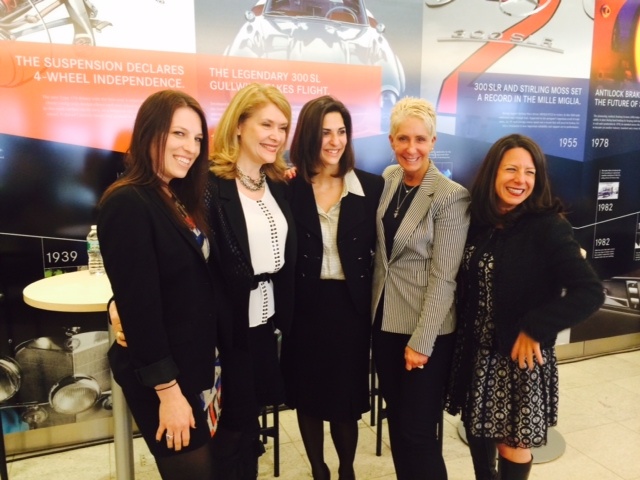 Each woman offered the audience –a group comprised of both male and female Mercedes-Benz employees of all roles, levels and departments– tangible examples and tips to inspire them on their own career paths. 1. Lean into the bad times: When asked what she thought of General Motors CEO Mary Barra and her handling of the company’s recall situation, Sam said she admired her willingness to “own” a crisis that she personally had nothing to do with, and that meeting with the victims’ families the day before she was to go on trial was a remarkable way to show empathy and true leadership. Sam’s takeaway? True leaders are measured by how they handle the bad times. By taking responsibility and using her company’s mistakes as a platform for growth, Barra likely elevated her standing in the public eye. 2. Crying in the workplace is okay: On the topic of gender bias in the workplace, all panelists agreed that crying on the job is okay. Sam said, “I’ve done it. I’ve cried in front of bosses, employees and even clients. It’s who I am; I’m an emotional being, and I lead with my heart. It’s been said that empathic leaders actually resonate more with employees and stakeholders, and I’d rather be authentic and own who I really am than apologize for crying.” One male audience member actually expressed his understanding, saying that as a relatively new grandfather he recently cried watching his granddaughters perform in a school play, and as a result, became more in touch with his emotions, allowing him to relate to female colleagues on a different level. 3. Take time for yourself: During the Q&A portion of the panel one audience member asked the panelists how they carve out time for themselves, despite managing very busy and stressful careers. Sam mentioned her morning meditation ritual as one way she disconnects from technology, ground herself and re-set her mind before diving into the workday. Streisand talked about her Tuesday/Wednesday ritual of putting the cell phones down for dinner with her partner both nights, and Meiler mentioned that when she took her job at Nick, she actually negotiated leaving the office by 6 p.m. each day to get home to her three young children, even if it means she needs to get back online after her kids are asleep. The common thread was setting boundaries and taking time to do what matters most outside of work to be more successful and effective at work.